SAN FRANCISCO - San Francisco Fleet Week is famous for the Blue Angels air shows, the parade of ships, large crowds and service members walking around in their uniforms. 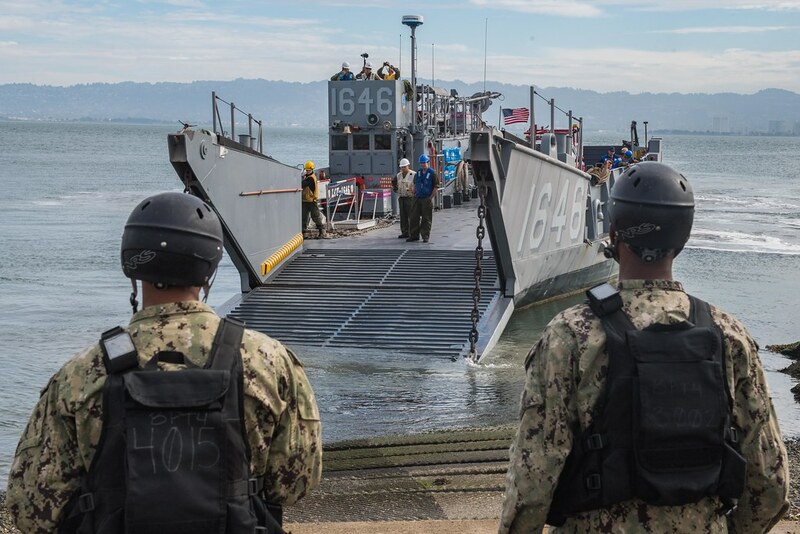 One part of fleet week that is not widely known is the Defense Support of Civilian Authorities (DSCA) exercise held annually to train government agencies to work together to respond in the event of a natural disaster. Training and preparing for the unexpected is the best form of readiness and the San Francisco Center for Humanitarian Assistance teamed up with the San Francisco Department of Public Health, U.S. Coast Guard, Navy and Marine Corps to host the 8th annual DSCA exercise Oct 1-3. Nearly three decades ago on Oct. 17, 1989, a 6.9 magnitude earthquake shook up the San Francisco Bay area, and in the span of 15 seconds took the lives of 67 people, injuring nearly 3,000 others, and causing more than $5 billion in structural damages. The DSCA exercise is a controlled environment designed to train and familiarize military forces and local first responders with rapid response capabilities to support recovery efforts following both man-made and natural disasters, such as hurricanes, earthquakes and industrial accidents. “The exercises provide us with the opportunity to practice our capabilities to ensure we can execute the exercises as they are written in the plan,” said Mary Ellen Carroll, executive director for San Francisco Department of Emergency Management. By partnering with the Department of Defense and practicing simulated catastrophes, the City of San Francisco and surrounding areas are able to witness first-hand the convenience of having a mobile force ready to assist in any case. While showcasing the ability of a landing craft utility (LCU) to quickly transport a San Francisco Fire Department coastal rescue vehicle, Rear Adm. Cedric E. Pringle, commander, Expeditionary Strike Group 3, explained the practicality of having an LCU. LCUs are heavy lift craft and have over twice the payload and six times the range of air cushion type landing craft. 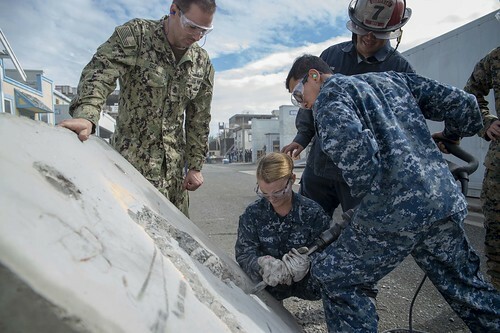 In addition to preparing for natural disasters, for the seventh year in a row, San Francisco Fleet Week included medical training exercises known as the Peer-to-Peer Medical Exchange. The goal is to provide an opportunity for naval medical professionals and local first responders the opportunity to work together to tackle a simulated catastrophe. A real-time simulated earthquake scenario was addressed on San Francisco’s Treasure Island. 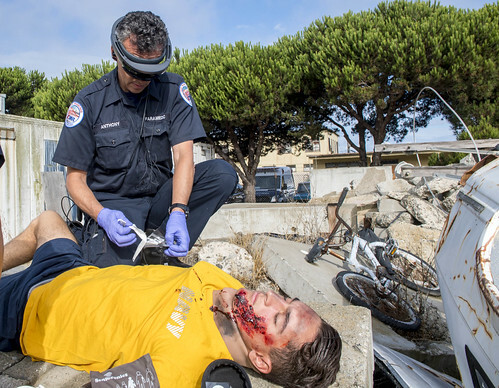 The scenario introduced cutting edge technology for the first time to a DSCA exercise in San Francisco – augmented reality glasses, which allowed wearers to see the medical professional who remotely assisted first responders in real time. Natural disasters or mass casualty incidents call for an “all-hands on deck” environment and the expected response is the successful partnership between local, state and federal government, as well as civilian partners and local medical resources. Hinting at more to come in future iterations of DSCA exercises, Rear Adm. Paul D. Pearigen, commander of Navy Medicine West, lauded the accomplishments of what the Navy could bring to the table in the event of a major catastrophe. In its 38th year, San Francisco Fleet Week continues to celebrate the rich naval tradition in the Bay area, honor the nation's service members, and facilitates in annual disaster preparedness training between the Navy, Marines Corps, Coast Guard and local first responders.